The story is found in Matthew 19, Mark 10 & Luke 18. OK. lets reads Mark’s account…. “Why do you call me good?” Jesus answered. “No one is good—except God alone. You know the commandments: ‘You shall not murder, you shall not commit adultery, you shall not steal, you shall not give false testimony, you shall not defraud, honor your father and mother. Jesus looked at him and loved him. “One thing you lack,” he said. “Go, sell everything you have and give to the poor, and you will have treasure in heaven. Then come, follow me.” At this the man’s face fell. He went away sad, because he had great wealth. WOW! There’s so much in these passage but let’s just take a look at the disciples reaction. What is it that made the disciples go “O.M.Goodness, if it’s difficult for a man like that to be saved then what chance has anyone? The disciples well understood from the Old Testament Laws that legitimate riches & wealth are a blessing from the Lord. So such a man is wealthy due to the blessing of the Lord because of His or his family obedience to the laws of Moses. Deuteronomy 28 plainly layout blessings for obeying and curses for disobeying the commandments of the Law. Not only that Jesus in fact affirms this cos when He gave the man the last 5 of the commandments as a way of to entering the Kingdom; the man was justified; and it says Jesus loved him for that. I imagine Jesus looking at his disciples and then to the man going “YES, you have been faithfully keeping those commandments, since childhood, I’m very pleased”. The disciples probably compared themselves to the rich man, thinking “man, if even us could enter the Kingdom, then this man surely deserves it more” So you can imagine the shock of their life when Jesus made the demand that he gives up his wealth to follow Him, and as a result the man went away in sorrow. Think about it, this wealthy man humbled himself by literally falling at Jesus’ feet which goes to show his desperation, character and faith in Jesus plus when Jesus asked him to give up his riches; He didn’t go “What? Who do you think you are commanding me to give up all my riches, keep your Kingdom, I’m out of here” No, it says his face fell and he went away sad. I’m saying all this to stress the fact that the rich man genuinely believed in Jesus and genuinely wanted to enter the Kingdom, He wasn’t faking it. So you can understand the jaw dropping moment when Jesus said “It’s hard for the rich to enter the Kingdom of God. In their mind, they could not understand how and why is it impossible for such a blessed and devout son of Abraham to inherit eternal life. So if it’s hard for this humble, obedient, blessed and faith filled man to be saved, then how is anyone going to enter the Kingdom of God? l love Jesus answer, He simply looked to the disciples and said guys there’s no chance any man could gained eternal life, It’s just impossible. How ridiculously absurd to even think that a man can gain eternal life by his own power and means. To see how ridiculous that sound, you have to understand what Salvation really is and how far we were from attaining it. Salvation in a short and single sentence is being resurrected from death (spirit, soul and body), to gain a new life, like that of Christ (a new heart and desire), then to be adorned with the very glory of God (love, power, righteousness, perfection) to be then raised up, joined together and seated with Christ in heaven to know Him as He knows you and then to rule and reign with Him. So how is a dead person going to get from death to reigning with Christ? It was in this context that Paul wrote the part of scripture that almost every christian today can quote; Ephesians 2:8.
vs 1-3 As for you, you were dead in your transgressions and sins, in which you used to live when you followed the ways of this world….. All of us also lived among them at one time, gratifying the cravings of our flesh and following its desires and thoughts. Like the rest, we were by nature deserving of wrath. Paul here in fact expand on Jesus’ statement that it is impossible for man to gained eternal life. From the moment Adam and Eve fell they pretty much died; spirit and soul, the body only took time to catch up with what had really happened on the inside. They inherited a sinful nature that leads them to do things that nature desires. This is what Paul meant by dead in our transgressions and sins; We (without God) sin because it’s our nature to do so and we give into the craving of our sinful desire because we do not have the desires of God to do otherwise. This is the state humanity was born in; into death, separated from the life of God. The best way to see this is to think of what Adam was before God breath His life into Him; Adam could not have gained the life of God even if He desired it and he wouldn’t desire it cos he was *lifeless. The unregenerate person (i.e. a person without the prompting and leading of the Holy Spirit) in his/her own will power can NEVER do anything to save themselves even if they truly desire/wanted to and NEITHER would they desire/want to do anything even if they have the power do it. No human being on earth has ever experienced life without God. For this reason we cannot even grasp the concept of life without God. Of course some people today live life indifference to God but that does not mean God does the same with them. If He did, they’ll all return back to dust. Everything and anything that we deemed good or pleasurable even in the slightest sense comes from God. Family, friends, jobs, houses etc, name it, if it’s good then it’s a gift from God. Unfortunately being fallen humans we sometimes pervert the good things God gives us and calls good things bad and bad things good. So it’s a laugh when some say we don’t need God to be good people. That there are so many decent and good people in the world who are not Christians or hold to any form of religion. To that I say, lets just remove everything good in that person’s life and see how good that person will be. Humans let to our own, will result to the default of our nature; wicked. This is what Jesus wanted to show the rich man, when he referred to Jesus as “Good Teacher”. If any man is good definitely it’s should be Jesus, I mean He’s the only man who never committed a single sin, however Jesus in his human nature know that He cannot be good apart from God. Yes, dead in our sins we were; what a perfect description for the state we were all destined for and just like Jesus put it “with Man salvation/eternal life is IMPOSSIBLE. vs 4-5 But because of his great love for us, God, who is rich in mercy, made us alive with Christ even when we were dead in transgressions—it is by grace you have been saved. So after Paul stating our incapability or inability to do or even desire anything to save ourselves, God in His mercy did for us what we wouldn’t and couldn’t do. In His mercy He did what was impossible for man even while we were still sinners, dead in our sins. 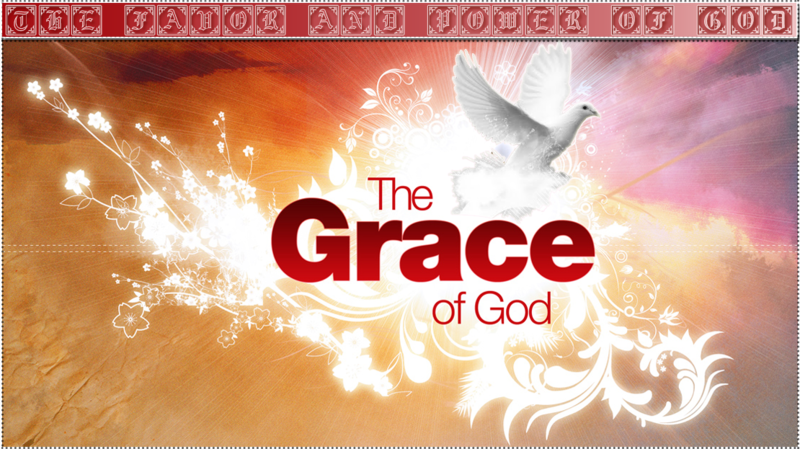 This is what Paul meant when He continued saying in vs 5..”It is by grace you have been saved“. Only God is willing (mercy and favor) and capable (the power, strength and ability) to resurrect people who are dead and bound to hell to bring them to life; His life. This willingness and capability is His grace towards you. vs 6-7: And God raised us up with Christ and seated us with him in the heavenly realms in Christ Jesus, in order that in the coming ages he might show the incomparable riches of his grace, expressed in his kindness to us in Christ Jesus. This same grace also lifted you up and secured your inheritance so that in the age to come you’ll really get to see the full extent of His grace to you; not just saving you from eternal death but uniting you with Christ & transforming you to be like Him in glory. It’s by grace (the favor of God through His strength and ability) you have been saved through the faith he gave you because you were incapable of it. It’s His gift to you since you wouldn’t & couldn’t do it by your own means. In light of this how could you possibly boast? You couldn’t because you’ll have no grounds to stand on. vs 10: For we are God’s handiwork, created in Christ Jesus to do good works, which God prepared in advance for us to do. Tags: dead in sins, Front, No one is good, strength of God, The grace of God, The Rich & the Kingdom of God, the sustaining power of God, the willingness of God, unmerited favor, who can be saved?